These adorable confetti cookies give a whole new meaning to “exploding flavor”! Filled with colorful Valentine’s Day sprinkles, these cookies are literally filled with love. Confetti cookies are so fun to make, and they’re great for getting kids involved in baking. You can make these cute cookies for any season or reason, and you could even fill them with candies, jam, fruit, caramel, or whatever your heart (cookie) desires! I made these with some sprinkles I found at the dollar section of Target. I also filled some with ice cream for a delicious after dinner treat. 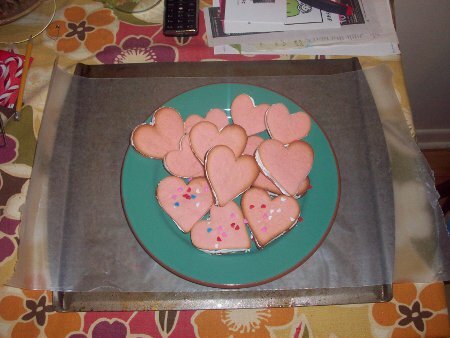 You can decorate the outside of the cookie if you’d like, but I figured I’d leave them as is, since I already went through the trouble of dying the cookies pink. These cookies would make adorable favors for weddings, baby showers, bridal showers, and more. Be creative and have fun in the kitchen with these adorable confetti cookies! Beat butter, sugar, and salt in a large bowl with mixer on medium high until light and fluffy, about 3 minutes. Reduce speed to medium and add egg; beat until combined. Beat in corn syrup and vanilla. Reduce speed to low and add flour in two parts. If desired, add 4 drops red food coloring. Shape dough into two disks, wrap and refrigerate 1 hour, or overnight. Heat oven to 350 degrees. Roll out 1 disk between 2 sheets of wax paper to ¼ in. thickness. Remove top layer of wax paper and cut out shapes using cookie cutters. Transfer to a baking sheet and bake for 12 minutes, or until cookies are golden. Transfer to a wire rack and cool completely before decorating. To make the icing, beat meringue powder, confectioner’s sugar, and warm water in a bowl with a hand mixer for 10-12 minutes, or until icing forms peaks. Place a cookie top side down and pipe a border around the edge of the cookie. Fill with sprinkles and place another cookie, bottom side down, on top of the decorated cookie to create a sandwich. Decorate the top of the cookie if desired (you will have plenty of frosting left over. If desired, you can double the cookie recipe and make the original amount of frosting without any problem). Let your icing dry overnight before transferring your cookies to an airtight container. Once cracked open, they should explode with confetti sprinkles!